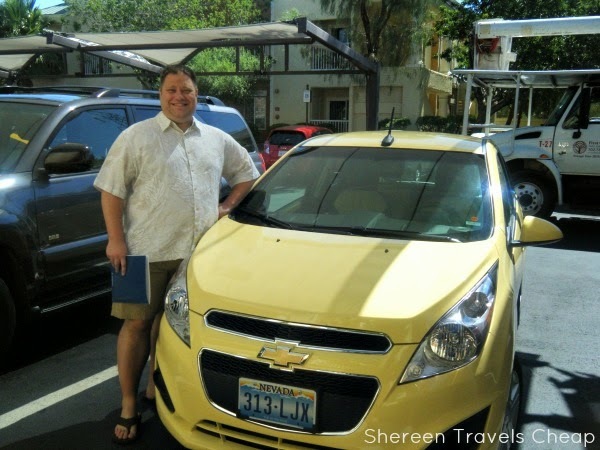 Most of the time when we travel, we rent a car, but it depends on where we go. 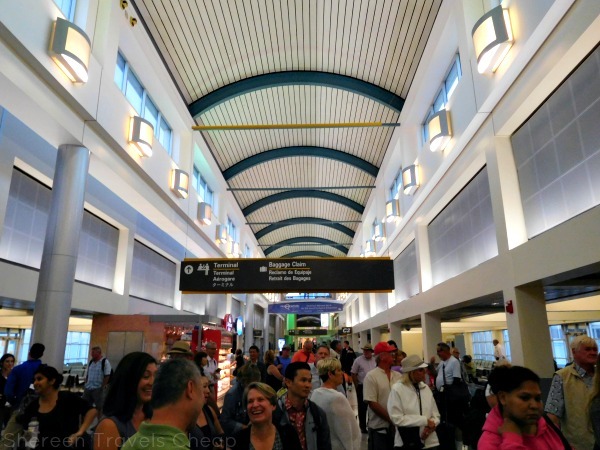 Some destinations are easier to get around by car, like Orlando or Los Angeles, and some places are not or it's just more convenient to use public transportation. Of course, there are those destinations we've rented a car in and either wished we hadn't or did a little more research before we went, like Ecuador. It's always smart to know how things work in the city you'll be traveling in. 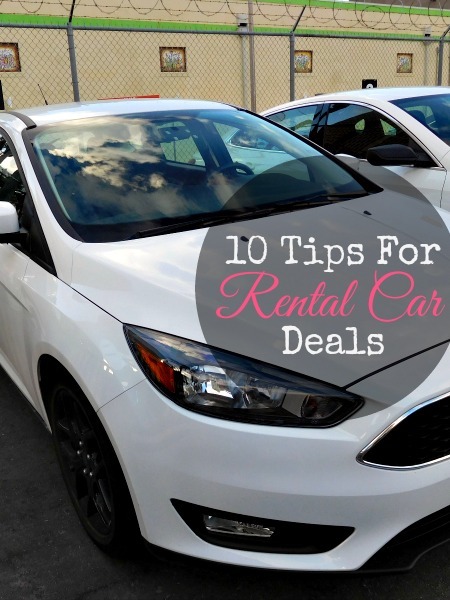 Security and roads without signs aside, here are my top 5 Dos and Don'ts of renting a car. 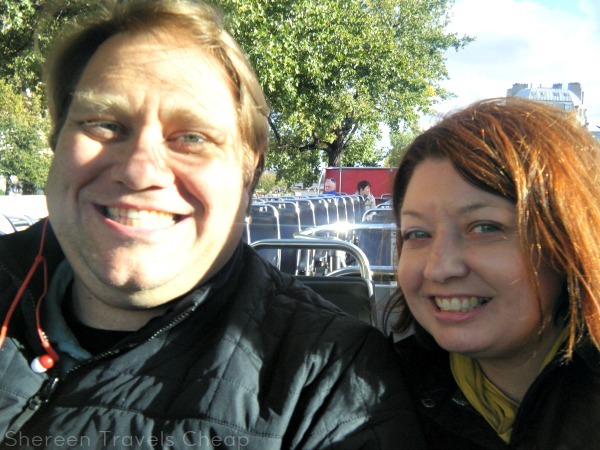 We travel as a couple and it's not always smooth sailing. 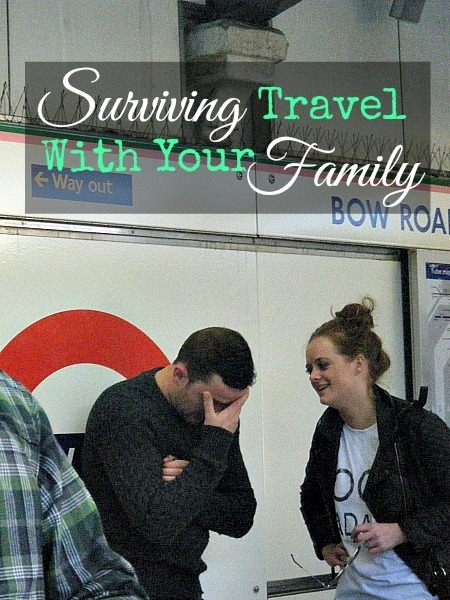 The same goes for traveling with your family. Sometimes you get mad at each other. Sometimes you are crabby and snappy and sometimes things just don't go as planned. Stay Home On Friday and Still Save! I almost never go out and fight the crowds on Black Friday...or the rest of the holiday season. I don't have the patience to push people out of the way to save a few bucks. 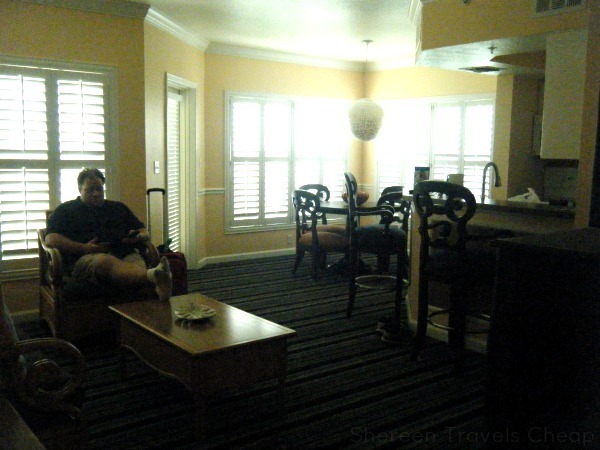 This year, why not stay in the cozy comfort of your own home and do your holiday shopping or travel booking? How can you do that? With the online sales and using Ebates. I never buy or book anything without first checking Ebates. What is it? It's a fantastic - and free! - site that offers you cash back for purchasing from online merchants. If you plan to make a purchase anyway, you might as well get something for being a loyal customer (or even a new customer). This Friday over 500 stores will be giving double cash back, which means you can keep even more money in your pocket, or buy more on the same budget! Here's how it works: Sign up is quick and easy, then you're ready to shop! When you have a hankering to buy something, say, at Sephora, go to Ebates, sign in, click on Sephora and it takes you straight to the main website. You must go through Ebates, so they can track your purchase. At checkout, make sure you use the same email address you used to sign up on Ebates and within a few days, your purchase will show up in your account. 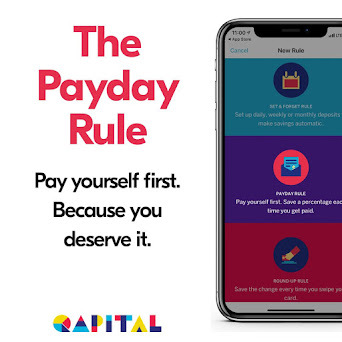 You can track your cash back total to see how much you saved and then every quarter, Ebates sends you a Big Fat Check (if you choose that method) or a Big Fat Payment via Paypal. You even get $5 just for signing up! Who else does that? If there are coupon codes available or special sales, Ebates will show them to you, helping you save even MORE! Actually, after your first purchase of $25 or more, instead of a $5 bonus, you get a $10 gift card! I like to use my cash back as a travel savings supplement. Each time I make a purchase, I rack up cash and then it gets deposited right to my Paypal account. I use that money to purchase travel stuffs, like Groupons, clothing, tours and more! If I can get more cash back with it, even better! Of course, you can use it for whatever you want. 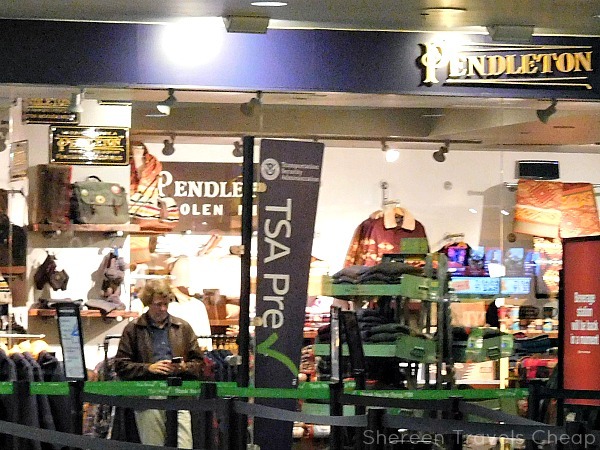 This time of year, it's perfect for booking your holiday travel and buying gifts. Stores you can shop at: Ebates has, literally, hundreds of online merchants you can choose from, including a long list of travel merchants. Just a sampling of those include: TravelSmith, Holiday Inn, Avis, Alaska Airlines, Camping World, Orbitz, Air France, Delta Airlines, HomeAway and even SkyMall! Keep your eyes out for the Daily Double. Each day one awesome merchant offers double cash back on your purchases for the day. And on Black Friday, a whole bunch of merchants give you double cash back. Why get elbowed in the eye trying to buy a gift this Friday when you can roll out of bed and hit the sales on your computer? No looking for parking, bundling up or hiding gifts in the trunk of your car with Ebates. Sign up now for free! 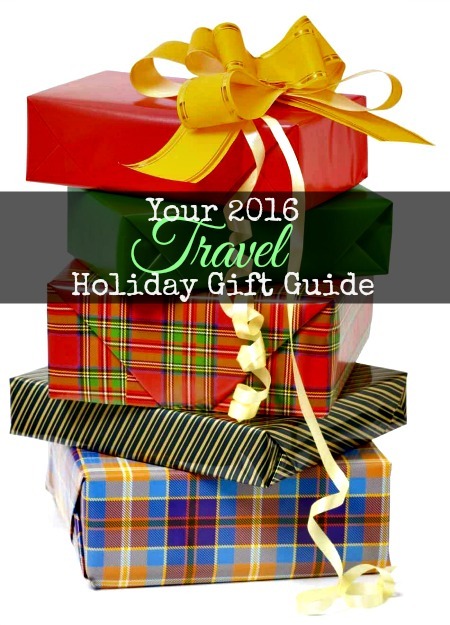 And if you ideas for gifts, check out my travel holiday gift guide. Are you taking advantage of Ebates' great deals this Friday or will you be braving the crowds at the mall? It's that time again! Black Friday is less than a week away and people are creating their attack plans for hitting up the stores to get the best deals. Well, I'm not doing that. I'll be at home in my pajamas eating a turkey sandwich and watching a movie while other people are coming back home with black eyes and less hope in humanity than when they headed out. I last went out on Black Friday six or so years ago and that was after 10am, because there's nothing at a store I'm willing to wrestle someone over. It had been a good five or more years before that when I went out when it was still dark out to wait in line for a store to open, and it was so horrendous, I said I'd never do it again. So, let's talk about the stuff you can buy from the comfort of your own home that won't be sold out five minutes after the stores open. You can buy them now, or buy them later. In fact, Wednesday I'll be sharing why you should also be using Ebates this holiday season (and every other time you shop online), to make sure to get the best deals without wasting gas, time or sanity. 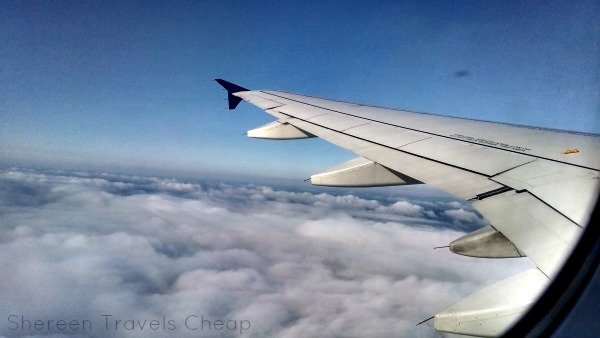 Are you on a budget this year, but have a traveler on your list? Perhaps you have a few extra bucks and want to buy a little something extra or a stocking stuffer. Here's what I'm suggesting for under gifts under $50. I've reviewed a lot of budget-friendly items over the last few years, or have purchased them on my own for my travels and want to tell you about them. If you have a slightly larger budget, purchase several of these cool things to make a little travel gift pack. Perhaps you can afford a little more for your gift recipient. Here are ideas for gifts from $50-100. 15. Travel Gift Cards: If you aren't sure what to get them, then buy something they can definitely use. 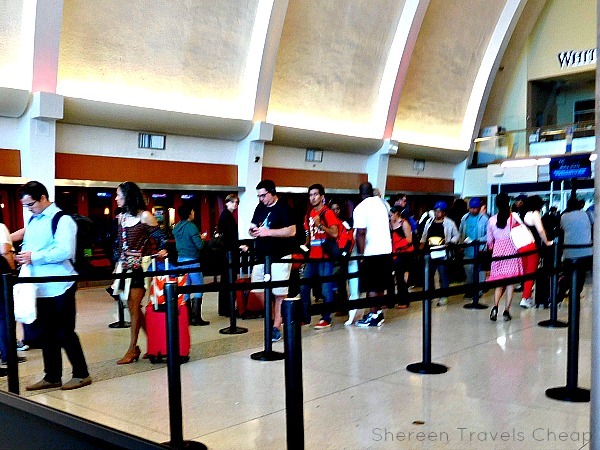 Choose a gift card from airlines, rental cars or hotels and make their travels cheaper. These are easy to purchase and work with your budget. Pay $50, $100 or $1,000 if you want. As much as I don't love giving gift cards as gifts, I make an exception for travel. 19. Travel Jewelry: Let them showcase their love of travel through necklaces, bracelets or earrings. You'll find a whole host of great pieces in all price points on both Amazon and Etsy. I also love this sweet little camera necklace from Uncommon Goods. Maybe you've been saving your pennies to make the holidays special for the traveler on your list, or you want to add these to your own wish list. These ideas are $100 or more. 23. Anatomie Style Women's Clothing: Just because you're not at home and trying to pack light doesn't mean you want to look like a schlub. Stock your carry-on with upscale pieces that are classic and versatile. Anatomie isn't cheap, but it's guaranteed to look good for years to come and help you blend in on city travels and cruise ships. 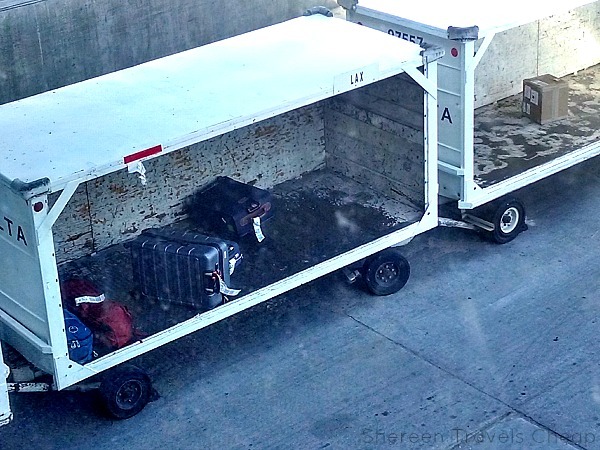 Pieces are also lightweight, so they won't take up more space in your luggage than necessary. From $45 on Anatomie. Now that you have some great ideas for gifts, you should be set for next week. And if you don't have the cash to spend right now, Amazon Prime can save you money as well as time, because you don't have to go out and shipping is free! Remember, if you aren't a Prime member, that's okay. Just spend $25 or more to get that free shipping included. Do you have your shopping list ready for the holidays? 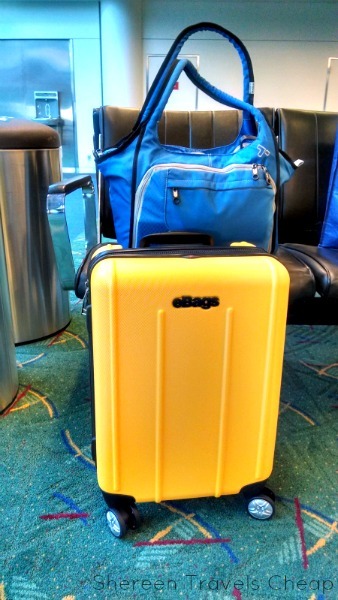 Or do you have another great travel item you like to buy as a gift? If you haven’t finished your holiday shopping yet, then you’re in good company. If you have, I might hate you a little bit. Either way, you’re going to buy stuff in the future, probably sooner rather than later. Why not save money on your purchases? With Frugaa, you’ll be able to buy more for less, which means you can spend more on vacation! Score! Plus, you can also save on vacation. Double score! What is Frugaa? Well, it’s a website that offers a bunch of different things: promo codes and discounts, deals, products and even reviews. Already got a website in mind for your purchase? Great! Search it on Frugaa to see if there are any deals or coupon codes you can use to make your order cheaper. You’ll learn a little more about the merchant you’re ordering from, see their featured products and brands (so you know what others are buying), explore the types of products they sell and see all the current promo codes that can be used. Frugaa updates their site throughout the day, so promo codes are always up-to-date and relevant. Want to know how to get the biggest discount? The site can help you by showing you the top deals and giving you tips about how to save the most at each particular merchant, you’re in the know for how to keep maximum bucks in your pocket. That means your holidays will cost less, or you can get more with the same money. Not sure where you want to buy your stuff? Use the search function to look for a specific item on Frugaa’s marketplace. It’s a mini search engine for your purchases and shows you any product deals you can purchase directly. 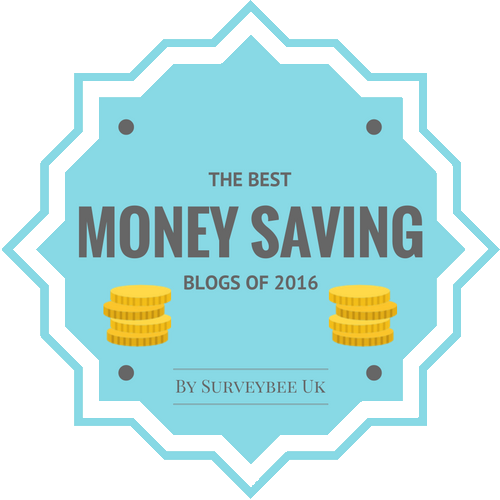 You can also use the Savings Calculator to stay within your budget. 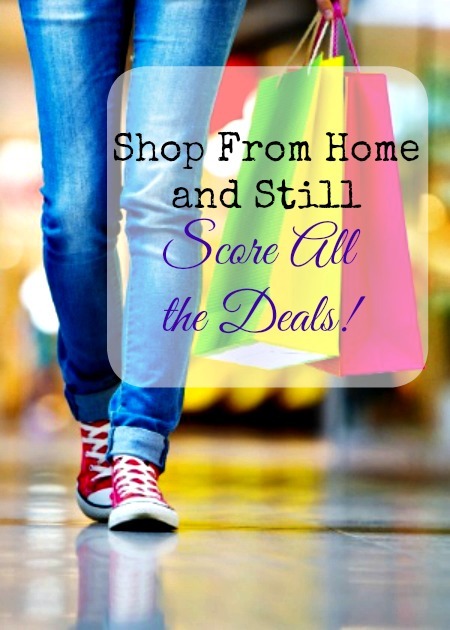 Look in a particular category, like electronics or clothing, or store and add your budget for said purchase. This helps Frugaa narrow down their deal/merchant selections to match the amount of money you can spend. I thought that was pretty cool, especially since one of those categories is travel, and you know how much I like to save on my travels. Say I have a budget of $500. 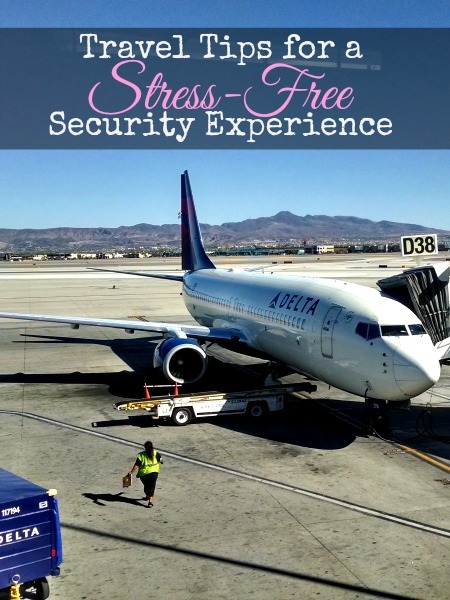 I select travel, slide the budget rule to $500, and hit search. Scroll down the current promos until you find a match for your trip needs. You’ll even see on the left side under the company banner how much you can save. As someone who would be happy to just get away for a bit of sun this winter, I clicked on the Sandals Resorts 65% off deal and learned that I can head to Jamaica for $161 per night per person. Not only that, but it includes a free night, catamaran cruise, air credit, booking bonus and extra savings for booking online. I’d be ready to pack my bathing suit and sunscreen right now if I didn’t already have a trip planned this winter. So, if you have to get away or need to make the rest of your holiday gift purchases (or both), Frugaa can really help you out. And after the holidays are over, you can continue to use it to save big bucks on many of your future purchases. You can use Frugaa without having an account, but if you have one, you can earn points in the rewards program (earn by searching, sharing, engaging and more) and then trade them in for gift cards, meaning you’ve saved even more money, just by doing what you’d normally do! Don’t want to search the site for deals? Subscribe to have the hottest coupons and deals sent straight to your inbox! No work needed on your part. Woot! Now, who out there is actually done with all their holiday shopping? We need inspiration to start ours. Disclosure: This post was brought to you on behalf of Frugaa.com, but all opinions are 100% my own. 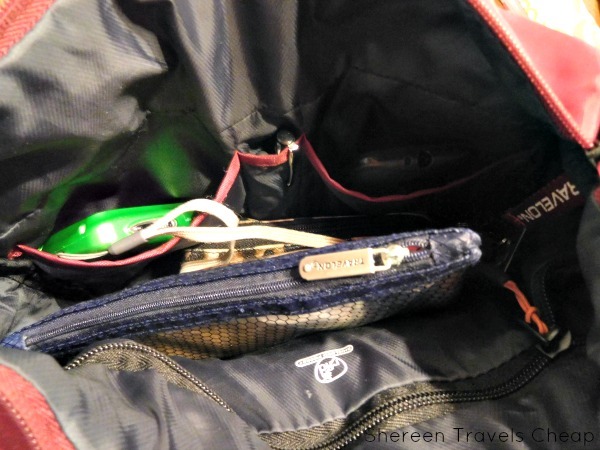 When you travel, do you need a little bigger bag than I usually showcase? Maybe you have kids or like to take more things or use it to carry your purchases. If any of these describe you, you’ll want to check out the Anti-Theft Active Medium Crossbody Bag from Travelon. I’ve been using it as my everyday purse since it arrived at my door, because it holds everything I need, plus carries other items I sometimes take with me, like magazines, my iPad mini and my lunch. When you’re on vacation, you want a bag that’s multi-purpose and this bag is definitely that. 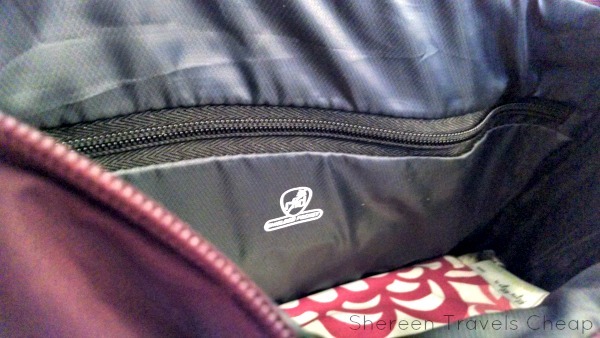 It has large zippered pockets inside and out that are anti-theft, so everything you keep inside, stays inside. Use this bag as a large “personal item” when you fly and carry your necessities: 3-1-1 bag, electronics, games, snacks, travel docs, passport, wallet. And when you get to your destination, take out the items you don’t need all day to lighten your load and save your back. It’s large enough to hold all your brochures and small purchases, but manageable enough to not get in your way when roaming a museum or browsing the outdoor market. Don’t want to carry your sweater? It’ll fit in there. That’s actually one of my favorite things about a larger day bag. I’m never missing any of my “just in case pieces”, like a scarf, card game, extra meds or band aids. 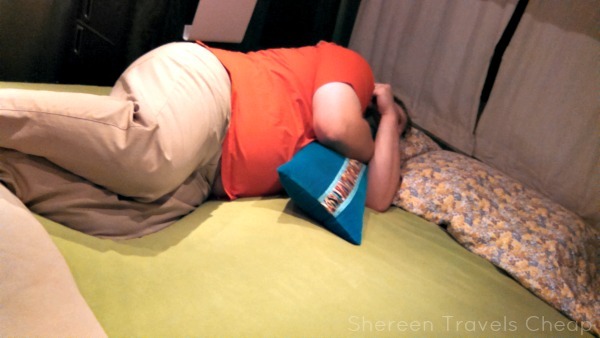 That’s not the best thing about this bag though. The Active line has a reflective fabric, so you can be seen in darker environments, even if you’re just crossing the street in the city. It’s always nice when people can see you instead of almost running you over. It also comes in lovely colors, looks sporty and is water-resistant. That’s a must in rainy climates like we have here in Portland. 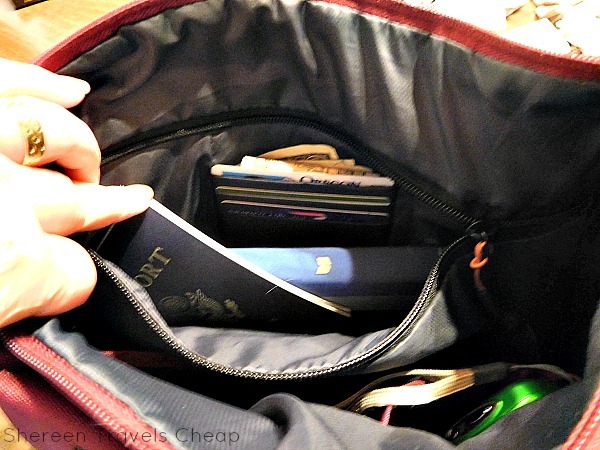 Inside, you'll find a large zipper pocket that is RFID-blocking, where you can stash your credit cards, ID, passport and travel docs, plus it's large enough for your tablet. I also use this to toss change into and keep my cash in there, so it's double secure! 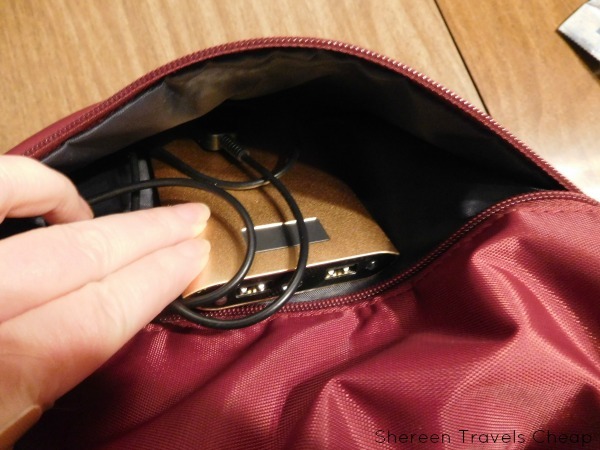 There's also two great slot pockets on the other side of the inside, where I put my phone, earbuds and my camera, because that way it doesn't fall into the bottom where I have tor rummage for it. These pockets are large enough to handle your extra big smartphone, but not that Galaxy 7, because you can't take it to the airport anymore. 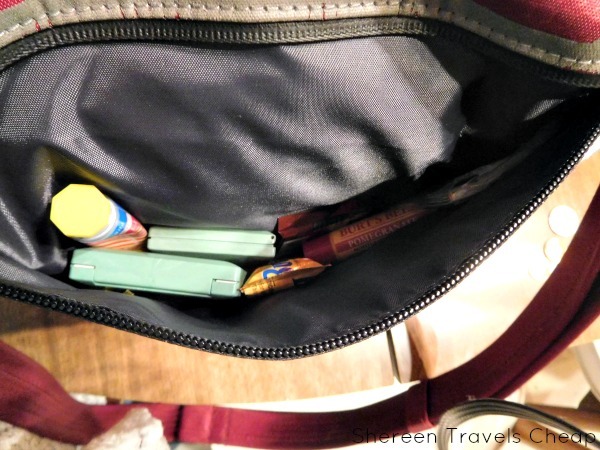 In between those two pockets is a pen slot, which holds not one, but two pens. Love it! 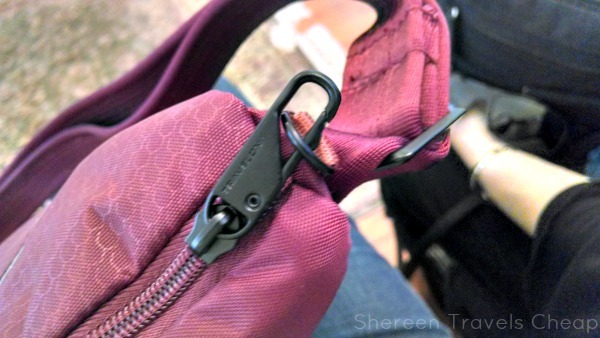 The outside has two zipper pockets, which take up about 2/3 of the size of the bag. one is lockable and the other is not, as it is meant to be worn against your side, where it would be pretty difficult to get into for someone with sticky fingers. 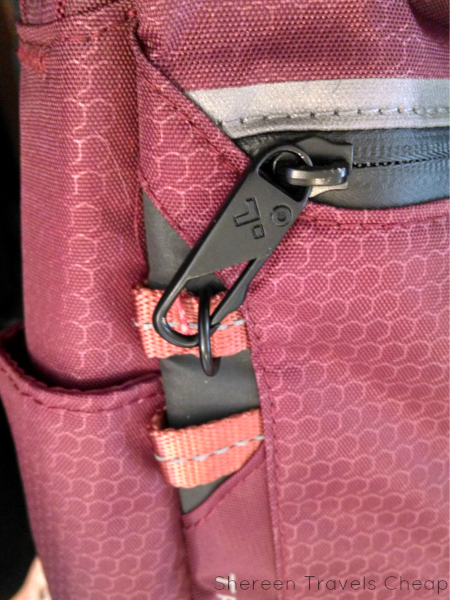 The locking zippers are really easy to use, but they don't have the little doodad you usually use your thumb to open it with, so thieves will have a difficult time trying to figure it out in time before you notice. For you, who knows how to use it, it's fairly simple and won't make it challenging to get into your own bag to get out your money. These side zippers are also rubberized to make them water-resistant and impossible to break (another security feature). 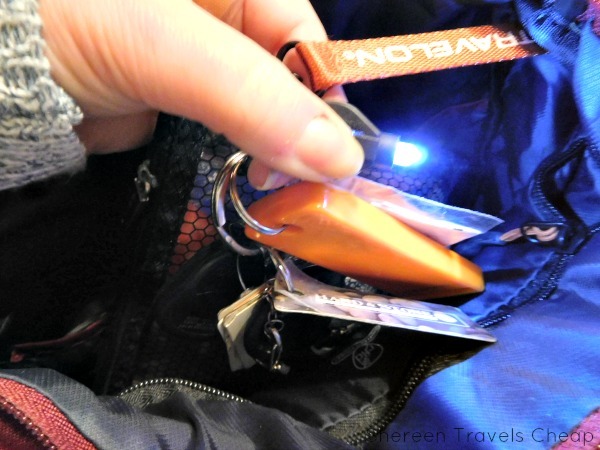 Though this isn't a Mary Poppins' bag, even though it holds quite a bit, you might just need a little help finding things in the dark, so Travelon has added their tiny flashlight to this bag too. It's attached to a clip leash, so you can always find your keys and, in my case, my business cards. 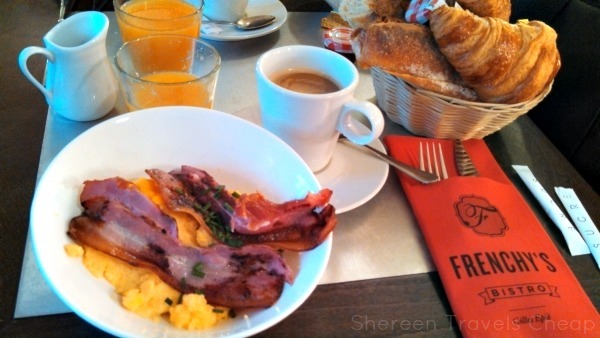 Worried your bag might get snatched while you're having lunch at that cute little sidewalk cafe? Fear not! This bag not only has a slash-resistant strap and body (for when you're out and about), but it also has a locking clip on the adjustable strap, so you can attach your bag to your chair or table and you feel secure while you're enjoying your meal. Don't forget to stay hydrated! Or dry. Whichever you choose. 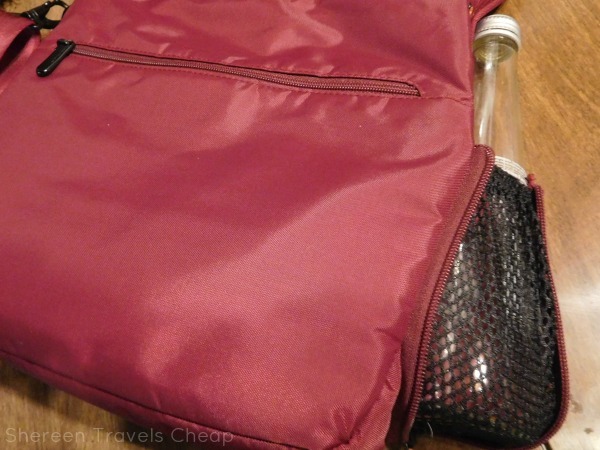 You have a nice zip-out mesh bottle holder on the side of your bag, which can also be used for your umbrella. It will fit a regular 16oz size bottle. I didn't have one on hand, so I improvised with this larger bottomed bottle I had in the fridge. It fits nice and snug. Then it zips closed when not in use. 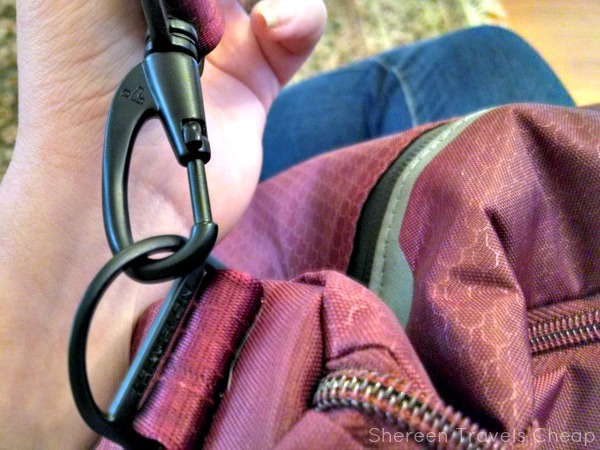 The adjustable shoulder strap is wide enough to be comfortable and not slip off your shoulder if you want to wear it over your shoulder instead of crossbody. It also adjusts to fit right on a small person or a tall person. 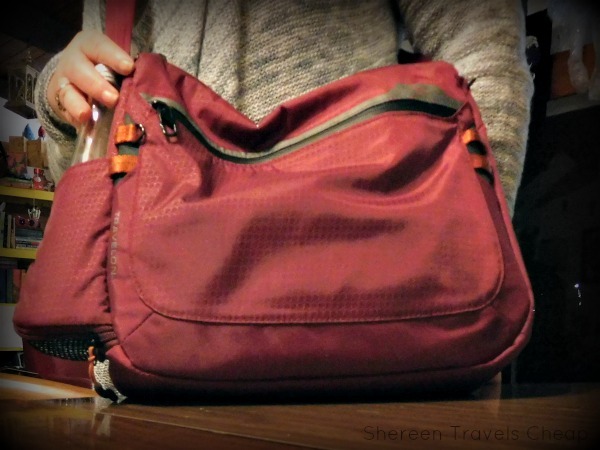 This a great bag for your travels, or as a gift for the traveler in your life. It's a reasonable size and price, plus comes in nice classic colors that are unisex. 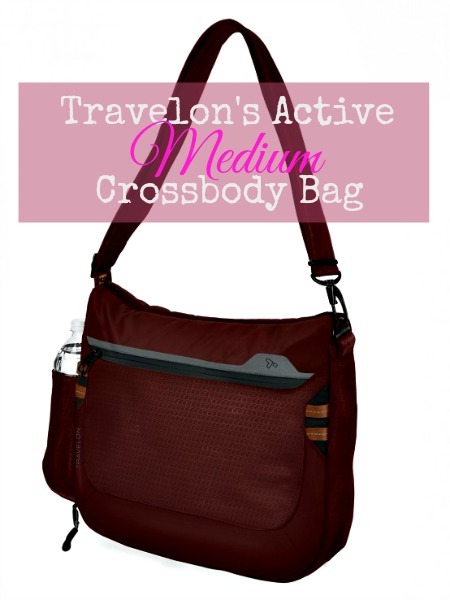 Additional specs: lightweight durable nylon fabric, size: 12.25" x3.75" x12"
Disclaimer: I received the Anti-Theft Active Medium Crossbody Bag from Travelon for the purposes of this review, but all opinions are 100% my own. 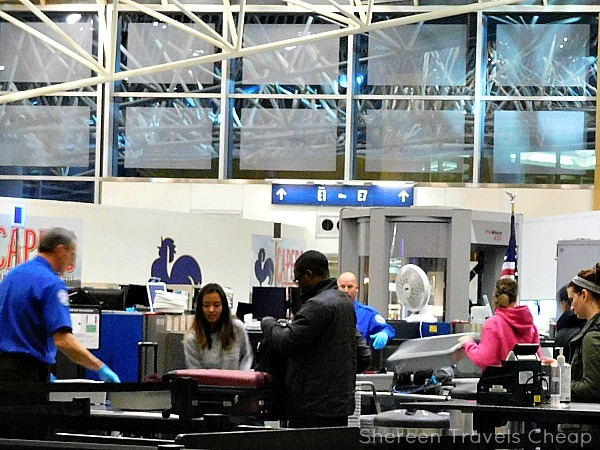 I love the airport, even during the holidays. I’m a weirdo, but I like shopping/browsing and trying the different places to eat. I love the fact that I’m going to go somewhere. I like to people watch and I enjoy checking out the airport art and other cool things they have that other airports don’t. These last two months I’ve been to the airport six times. Twice to come and go and four times to pick up or drop off. I’ll pay $3 to park so I can wander around. Sometimes I find awesome stuff there, plus Portland International is America’s Favorite Airport four years running. How can I resist that?